This site is dedicated to providing and soliciting genealogical information (photos, documents, stories, etc.) on the family of Knud Olsen Rye (Rea) and Astri Tidemandsdatter Hilmen. A link to historical documents is often indicated within the narrative. Click on the link to see the document, and use your "back" button to return to the narrative. 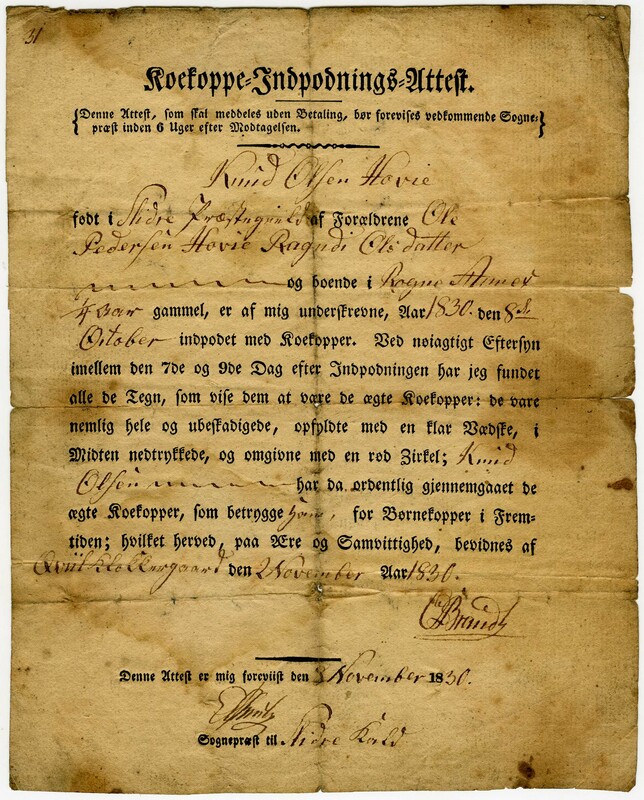 Many documents are in Norweigian and in the original handwriting or gothic alphabet. A listing of all historical documents including some transcriptions and translations is also provided at the bottom of this page. The Rea Family emigrated to America from the Rye farm in Nord-Audrdal, Norway, and it is from this farm name that their surname in America was derived. Nord-Aurdal is in the Valdres Valley region of southern central Norway (see maps). In America, the family settled in Gibson Township of Manitowoc County in Wisconsin. Later, most of the family emigrated to Texas. Although the family originally went by the surname of Rye when they first came from Norway, the spelling was eventually changed to Rea, probably in Texas. The Norwegian pronunciation of Rye is "ree-uh" and so the phonetic spelling of this probably became "Re-a" in the Texas dialect. Over time, the original Norwegian pronunciation was dropped, and the name became pronounced as "ray". Want to know what are your cousins doing? Read their Facebook pages and find out. Additions and corrections to the information contained within are always welcome by contacting Bruce Wiland (wiland@att.net, 512-443-2918, 1510 Oxford Ave, Austin TX). Knud Olsen Rye, the fourth of six children and the youngest son of Ole Pedersen Hove and Rangdi Olsdatter Røen, was born in 1830 on the Hove farm in the Rogne parish of Øystre Slidre clerical district. Knud’s name at birth was Knud Olsen Hove (sometimes spelled as Hovie), Hove being the name of the farm on which he was born. Astri Tidemandsdatter Hilmen, the oldest of nine children of Tidemand Olsen and Guri Alfsdatter Hilmen, was born in 1832 on the Hilmen farm in the Ulnes parish of Nord-Aurdal clerical district. She was confirmed in the Ulnes church in 1846. Astri also experienced some name changes. A “d” was occasionally added to the end of her first name, and in the United States, her name was americanized to Esther or Ester. Knud and Astri were married in March, 1854 at the Ulnes church in Nord-Aurdal. Knud probably left the Hove farm shortly before his marriage. Knud and Astri lived on several farms (Bøe, Rognaas, Oppen, and Rye) in Nord-Aurdal after they were married. H.K. Rea, one of Knud and Astri’s children, once said that his father had a winter home in the Valdres Valley and a summer home in the mountain. Knud and Astri’s first child Ole was born on Bøe in 1854. Ole was named for Knud’s father. Tidemand was born on Rognaas in 1856. He was named for Astri’s father. Rangdi was born at Bøe in 1859. She was named for Knud’s mother. 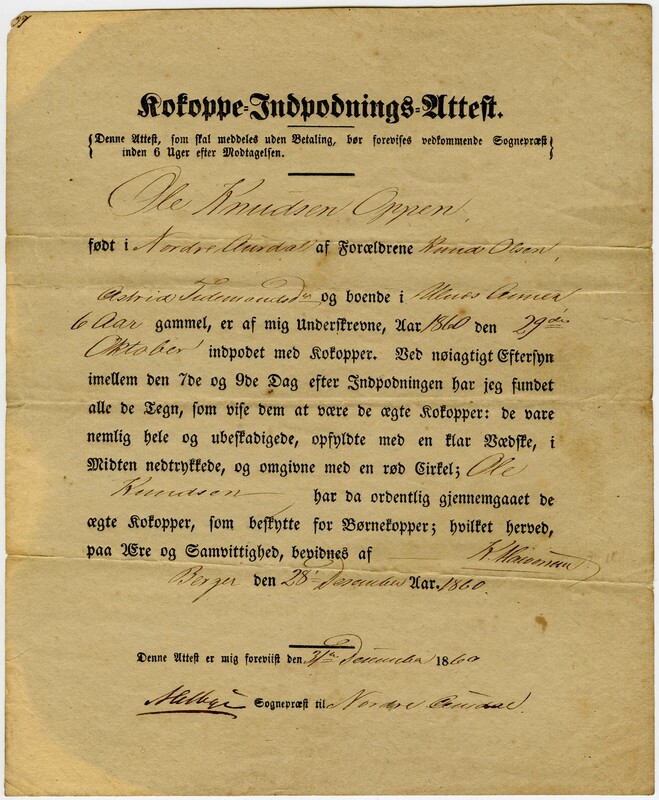 Several documents indicate that Knud, Astri, and family then moved to the Oppen farm, probably in 1859 or 1860, where they lived until sometime in 1861 or 1862. 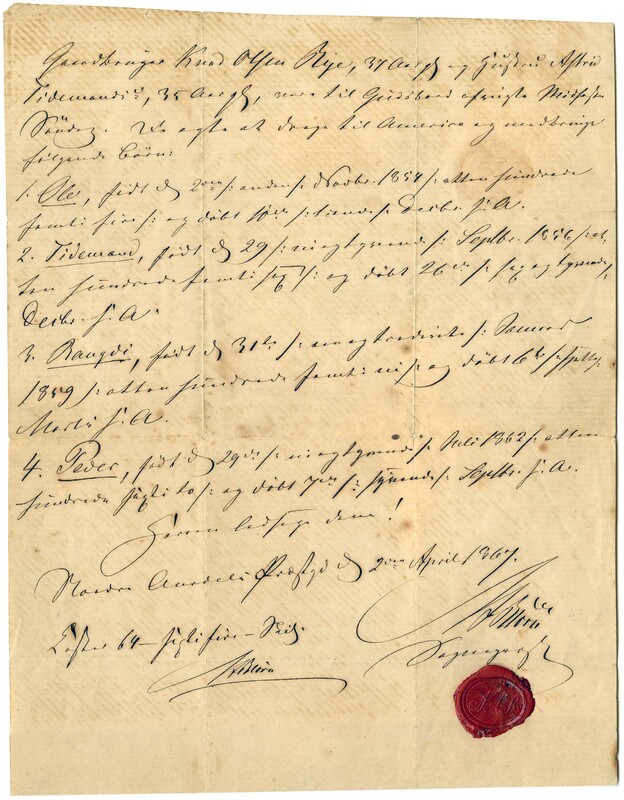 The cowpox vaccination certificate of Ole is dated December 28, 1860 and gives Ole's last name as Oppen and residence as Ulnes parish in Nord-Aurdal clerical district. 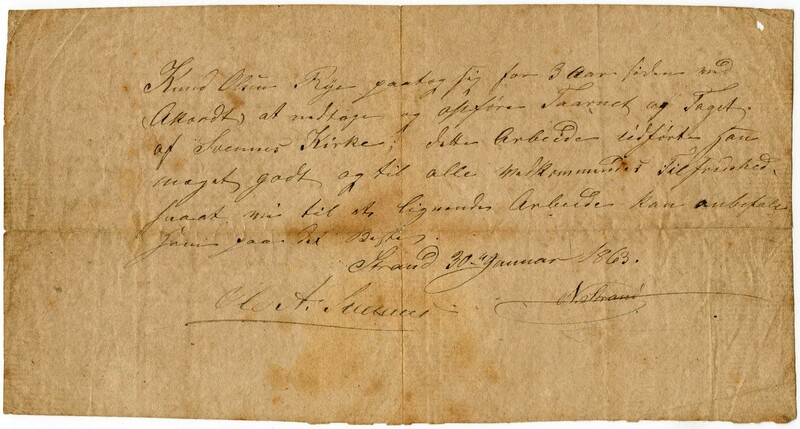 A loan document dated January 28, 1861 states that Knud Olsen Oppen had loaned Ole Tidemandsen Hilmen (Astri's grandfather or brother) some money, so Knud was living at Oppen at this time. Guri, the fourth child, was born at Oppen in April, 1861. She was named for Astri’s mother. Knud and Astri eventually settled on the Rye farm in Svenes parish (see Figure4), where Knud became known as Knud Olsen Rye. 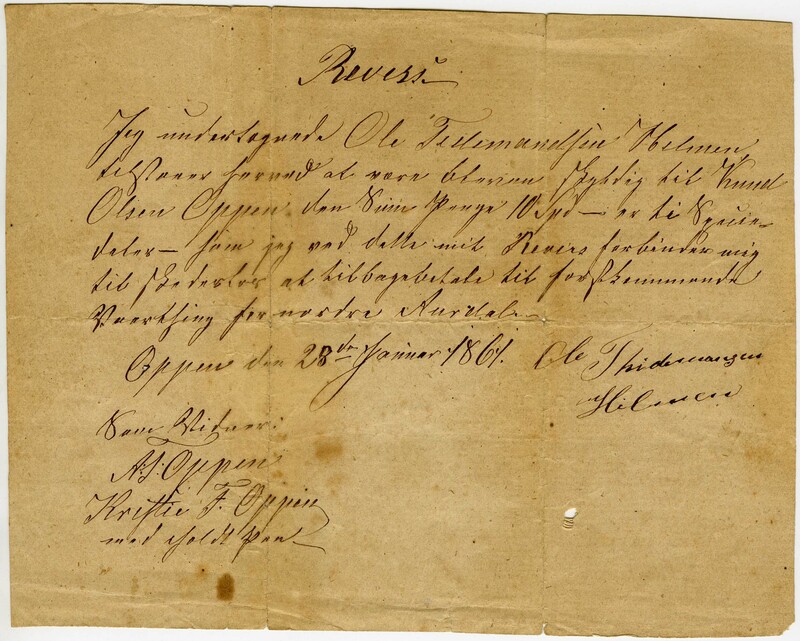 Another loan document indicates that Knud Olsen Riye [sic] loaned Ole Olsen Hipe some money that was to be paid back on April 14, 1862. Hence, Knud appears to have moved from the Oppen farm in Ulnes to the Rye farm in Svenes sometime between January, 1861 and April, 1862. The fifth child Peder was born on the Rye farm in July, 1862. 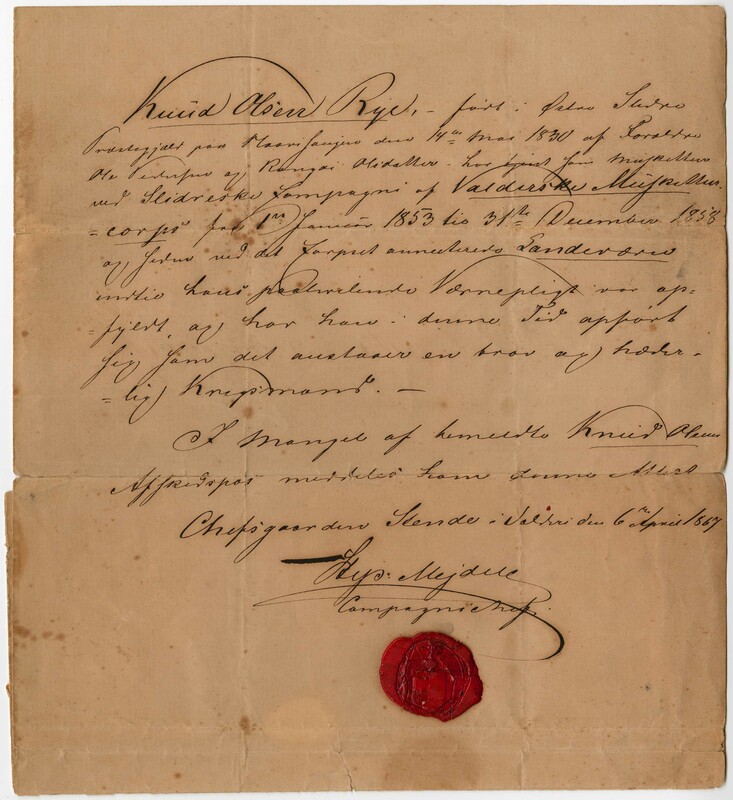 A cowpox vaccination certificate for Peder is dated June 29, 1865 and gives Peder's last name as Rye and residence as Svenes in Nord-Aurdal. Knud pursued several occupations including farmer, mason, carpenter, and steeplejack. 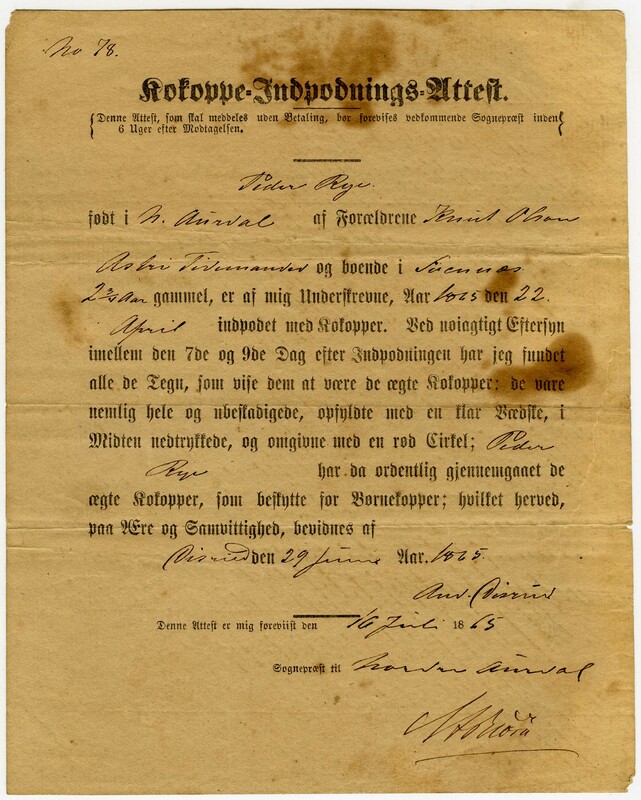 A letter of recommendation dated January 30, 1863 states that Knud Olsen Rye had repaired and built the tower and roof of the Svennes Church three years prior and that the work had been completed very well and to the satisfaction of all concerned. Knud's military service record indicates he served in the Valdres Muskets Corps for six years from January 1, 1853 to December 31, 1858 and in the Corps' Second District Militia. The 1865 census lists Knud (age 36), his wife Astri (age 34), and five children , Ole (age 12), Tidemand (age 10), Peder (age 4), Rangdi (age 7), and Knud (age 1), living on the Rye farm in Svenes parish, Nord-Aurdal. There is no record of daughter Guri in this census. It is very likely that she died as a child sometime between her birth in 1861 and the census in 1865. Astri's parents had previously emigrated to Wisconsin before the Civil War and probably persuaded Knud and Astri to come to the United States. 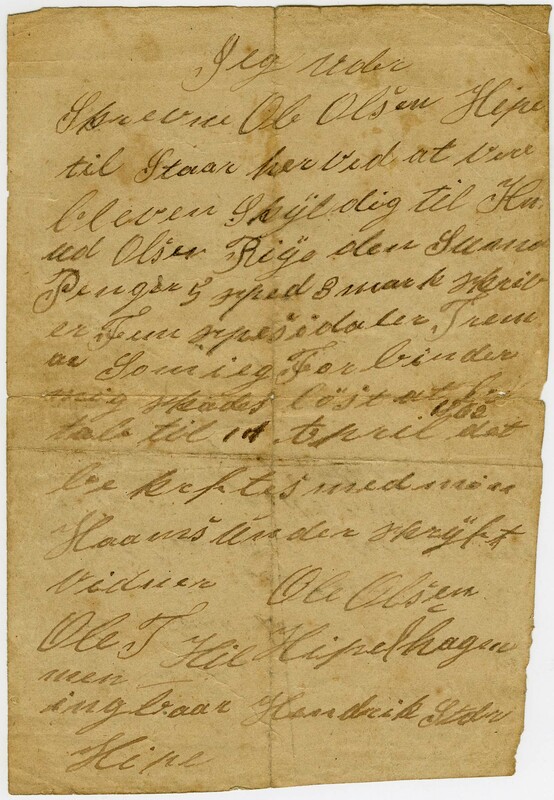 According to their passport, Knud (age 36) and Astri (age 35) left Norway for America in April 1867 with their five children: Ole (age 12 yr 5 mo), Tideman (age 10 yr 6 mo), Rangdi (age 8 yr 2 mo), Peder (age 4 yr 9 mo), and Knud (age 1 yr 4 mo). Astri was about three months pregnant with Oscar John when they left. 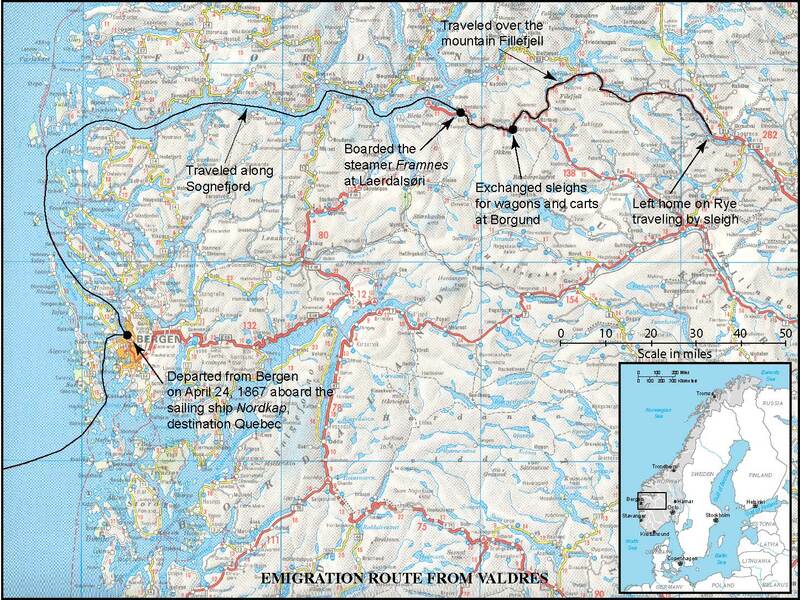 The family and large number of others from Valdres left home with sleighs traveling over Fillefjell to Borgund where the sleighs were exchanged for wagons and carts going down to Laerdalsøri on Sognefjord (see map). This trip usually required four or five days but was somewhat longer because the demand for wagons and carts was greater than the supply. At Laerdalsøri, a fight ensued with the Laerdals and things looked bad for the Valdreses. However, since the Laerdals had struck the first blow, there were no arrests made as had been threatened, and the emigrants were permitted to continue. The group took the steamer Framnes to Bergen. After a nine-day wait, the ship Nordkap set sail from Bergen on April 24, 1867, the Wednesday following Easter. On board were 235 adults, 97 children between the ages of one and fourteen years, and seventeen infants under the age of one year. After seven weeks sailing, the ship arrived at Quebec's harbor on the night of Pentecost, Sunday June 9. The next Thursday (June 13), they went ashore and on Saturday (June 15) of that week boarded a train to Port Sarnia arriving there on Monday night. On Tuesday (June18), they were brought over the river to Port Huron. U.S. custom duties were paid, and everyone was packed together below deck on the screw steamer Sun that evening. On Thursday night June 20, it landed on the old pier at Manitowoc, Wisconsin. Knud bought a 40-acre farm and settled in Gibson Township, Manitowoc County (see Figures 10 and 11), one and one-half miles northwest of Mishicot on the south side of the road to Green Bay (now called Highway 147). He later bought another 40 or perhaps 60 acres and managed to maintain his large family in some comfort. Knud and Astri added four more children to their new home in Manitowoc County, Wisconsin. Oscar John arrived about four months after coming to America and a daughter Gelena was born in 1870. Gelena’s name was probably an americanized form of Gurine, and she was probably named after her deceased sister Guri in accordance with Norwegian naming practices. A letter to Gelena from her father written in 1899 greeted her as Gurine. In this letter, her father also asked her to greet his son Knut for him ( referring to H.K.) indicating that he still called his children by their Norwegian names. Emma was born in 1872 and Clara Pauline, the youngest, in 1874. 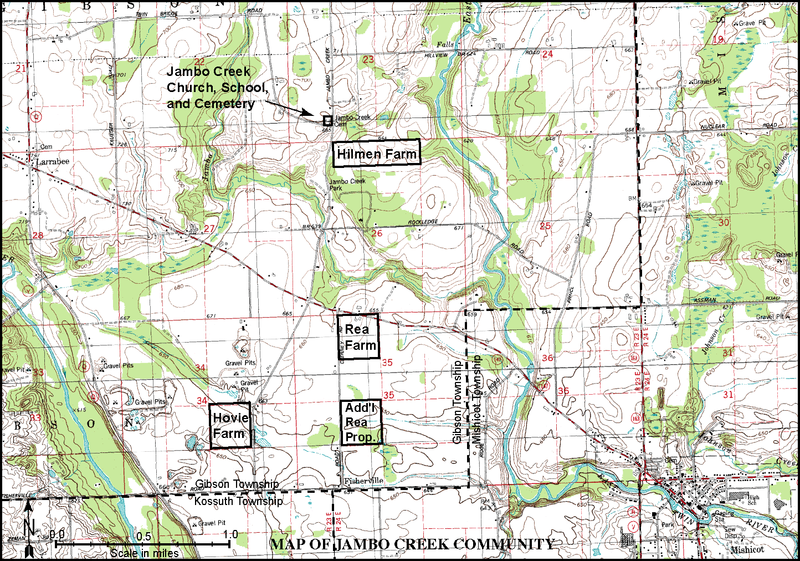 The children walked about one and a half miles to the one-room Jambo Creek school, which was north of their home probably in or near the church. This was probably a German Parochial School then and Ole (or O.K. as he was known) learned to speak German fluently from one simple textbook. He also learned a great deal of French from the settlers and the Indians in Wisconsin. The area around Gibson Township had a large number of emigrants including the Norwegians, French, Bohemians, and Italians. While snow was melting in the spring, there was no school. At home in Wisconsin for entertainment, such games as Checkers and Fox & Geese were played, sets of which could be made by hand. The children also played Pump Pump Pull Away, Hide and Seek, and Jump the Rope. The family regularly attended the Jambo Creek Norwegian Lutheran Church where the children were taught Catechism by the minister and each was confirmed in the Lutheran Church at about the age of 14. Astri regularly read the Bible to the family. Her father was a staunch churchman and one of her brothers, Peter T. Hilmen, became a Lutheran minister. The family lived in a big stone home and Astri would sit several hours almost every day at her spinning wheel. Of course, her daughters gathered around to watch, and soon learned to help her. Gelena says she knitted when she read books. She learned how to knit from Astri when very young and was soon knitting her own stockings. 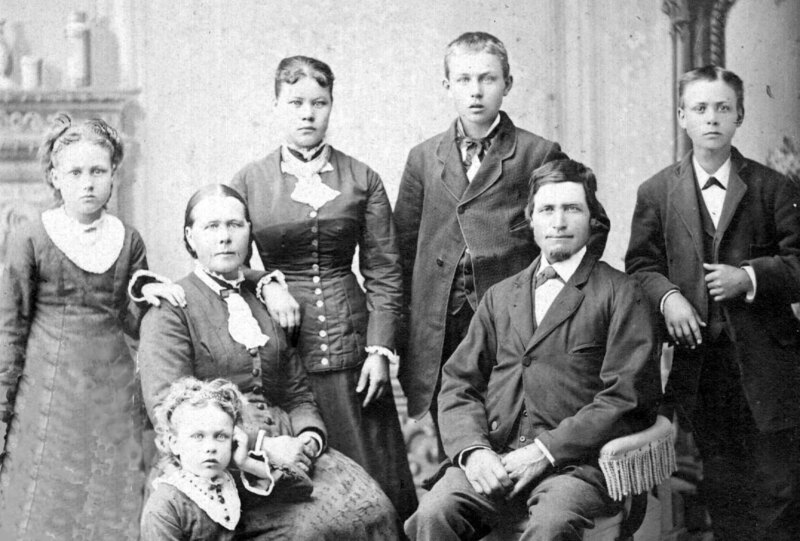 The U.S. Census taken in 1880 shows Knud (age 50) and Astri (age 48 and listed as Ester is the census) living in Gibson Township with five of their children: Randy (age 20, listed as Eranda), Knud (age 14), John (age 12), Gelena (age 10, listed as Gelina), and Emma (age 8). A photo of the family at about this time can be seen here. Ole and Tidemand had already left home. The youngest daughter Clara Pauline had died in December of the previous year at the age of five and was buried at the Jambo Creek Cemetery in Gibson Township. Six of Knud and Astri's children came to Texas beginning with Ole in December 1876. Peter alone stayed in the North, establishing himself in Joliet, Illinois. Ole (or O.K. as he was called) left for Texas in December 1876 at the age of 22 eventually settling near Pottsville in Hamilton County. In 1885, T.K. (age 28), his wife Helen, and two children moved to Texas settling on a farm near T.K.’s brother O.K. Knud, Astri, and daughter Emma (age 13) also came to Texas in 1885, very possibly traveling with T.K. and his family as far as Norse. Knud, Astri, and Emma stayed at the home of John Rogstad in Norse. In 1886, Astri (or Esther as she was now known) went to visit her sons O.K. and T.K. near Pottsville in Hamilton County. During those days, there was trouble between the cattle and sheepmen. The cattlemen did not want the land fenced and tried to drive the sheepmen out, even though the sheepmen had bought the land. One night, the cattlemen tried to set the O.K. 's house on fire. Astri and O.K. 's wife Anna heard some noises in the night and managed to extinguish the flames. About two weeks later while the men were away, the house was set on fire again. This time it burned up. Anna was pregnant at the time and Astri dashed back into the house to retrieve a trunk with some of the boys clothing. Astri was so severely burned that she died the next day. O.K. and T.K. took her in a wagon to Norse, fifty miles away, reaching the church in the night. They left her at the church in her coffin and went on to the Rogstad's. She was buried at Norse. Knud and Emma continued living with the Rogstad's and O.K. 's family lived with T.K. while a new house was built. At some later date, Knud returned to Wisconsin to live. In 1887, one of the brothers (O.K. or T.K.) wrote to Gelena to tell her that she should come to Texas. Gelena (age 17) left for Texas in May of that year. She married John Swenson in 1891, and they settled in Clifton. About this same time, the youngest brother, Oscar John, was attending Central College at Walnut Springs, Texas and the eldest sister Rangdi (or Randy) was living in or near Cleburne, Texas. In the summer of 1888, Randy died leaving four children. It is not currently known when Oscar John or Randy came to Texas. Harold (or H.K. ) came to Texas to live in 1889 and began working in Dublin, Texas for the Ft. Worth and Rio Grande Railroad, later moving to Dallas. Emma married John Hoff in 1897 and they settled in Comanche. Oscar John eventually settled in Clifton, marrying Hilma Bergman in 1898. Knud died in Manitowoc, Wisconsin in March, 1900. His body and possessions were sent by train to his daughter Gelena living in Clifton, Texas, and he was buried next to his wife at Our Savior’s Lutheran Cemetery at Norse. Knud and Astri had 10 children. Two of them, Guri and Clara, died young. Peder married but had no children. H.K. had two daughters that married, but they had no children. So, there are six remaining branches to the family tree with living descendants. Click on one of the branches below to see information about that branch. Click here to see photos of past Rea reunions. Knud and Astri had 10 children, 44 grandchildren, 46 great grandchildren, and 117 known great great grandchildren. Those shown in red are known to be deceased. To date, we have identified 501 total descendants. The 3rd edition of "The Rea-Hilmen Family History and Family Tree" was published in 2003 and is now out of print. The 4th edition is now being prepared. This site may be freely linked to but may not be duplicated in any manner. Comments and questions concerning these webpages should be directed to wiland@att.net.